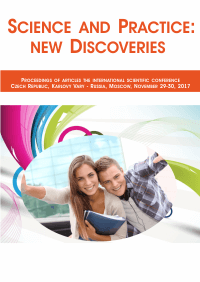 Science and Practice: new Discoveries: Proceedings of articles the international scientific conference. Czech Republic, Karlovy Vary - Russia, Moscow, November 29-30, 2017 | Книжный магазин интернет-проекта "Наука и образование on-line"
Proceedings includes materials of the international scientific conference «Science and Practice: new Discoveries», held in Czech Republic, Karlovy Vary-Russia, Moscow, November 29-30, 2017. The main objective of the conference - the development community of scholars and practitioners in various fields of science. Conference was attended by scientists and experts from Azerbaijan, Kazakhstan, Kyrgyzstan, Russia, Tajikistan.